The pocket-sized MPro150 projector from 3M makes it possible to produce pitches on the go. Welcome to the age of the multi-media elevator pitch. 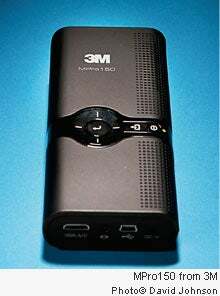 The battery-powered, pocket-sized MPro150 from 3M projects a decently bright, 8- to 50-inch image on anything from an elevator wall to the back of an airline seat. It features a relatively crisp LED picture, 20,000 hours of lamp life, two hours of projection time, as much as 3 GB of memory and adapters and control software that can project everything from your PC's desktop to those lingering episodes of Lost on your iPhone. The pico-projector demand is fueled by entrepreneurs who need to have a memorable pitch ready no matter where they are. "There is a coolness factor that can be a big advantage in a selling situation," says William Coggshall, president of consultancy Pacific Media Associates in Menlo Park, Calif. The 3M projector (which lists for $395) also stores and manages most common business files such as Word, Excel and, yes, PowerPoint. Although not nearly as bright as traditional portable projectors, the MPro150 has built-in content management tools that are easy to use--and it is guaranteed to fit in your luggage.